Have you ever wondered what would you be with your bachelor’s degree in Tourism and Hospitality Management? Most people believe that studying Tourism and Hospitality Management means a career in the service industry. That is not true at all. I could not believe that one day I would be a teacher, but that’s what I am now. 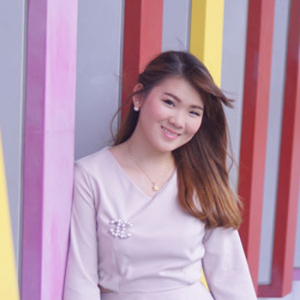 During my four years in Mahidol University International College (MUIC), I studied various courses in which I gained different perspectives. Until I took the Event Management course. Among the activities of this course was a visit to the orphanage foundation at Sam Phran. The orphans there were not only pitiful, but they also did not have a chance to obtain a good education as well. This experience encouraged me to do something good for children. Being a university student was not challenging enough. However, I was inspired by visiting the schools in the countryside, wherein I had a chance to teach children. Apart from this, I was a tutor during my college years. Some people thought that it would affect my studies, but it did not. I still remembered when I was on my freshman year, I got a GPA of 2.20 but somehow I was able to make it to the Honor’s List on my graduation. My goals are to support students so they would have a successful life, be keen learners, and grow up to be positive, active, and compassionate global citizens. I model this as an educator, seeking opportunities to further develop my skills and professional knowledge. I share experiences with my students, providing a solid foundation through qualities like the ability to set goals, commitment, persistence, and dedication. Building and sustaining positive and respectful relationships with students are the foundation to effective student learning. I care deeply for my students and through strong relationships, get to know and understand each child – academically, socially, physically, emotionally, and spiritually. Students learn best when they have a genuine voice in their learning environment. My teaching style promotes a positive class where students can negotiate their learning and environment, share the responsibility, and develop democratic relationships. Letting the students’ voice be heard is empowering for students and maximizes their enjoyment of learning. I strongly believe in the quote, “Education is the passport to the future, for tomorrow belongs to those who prepare for it today.” When we share knowledge to people, they get a better chance to master themselves. What I learnt from MUIC can support me in accomplishing my objectives. I am proud to be an MUIC alumna!